The 2012 Olympics might best be remembered for being some of the most over-sponsored games ever. But even product placement can occasionally be awesome, like these 1/4-scale RC Mini Coopers that will be used to retrieve hammers, shots, discuses, and javelins when the track & field events finally get under way. Despite being scale models, the cars still weigh about 18 pounds because they're each filled to the brim with batteries. But since they're toting such heavy gear—up to 17 pounds of it—they can only ferry equipment back to the competitors for about half an hour before needing an 80-minute recharge. 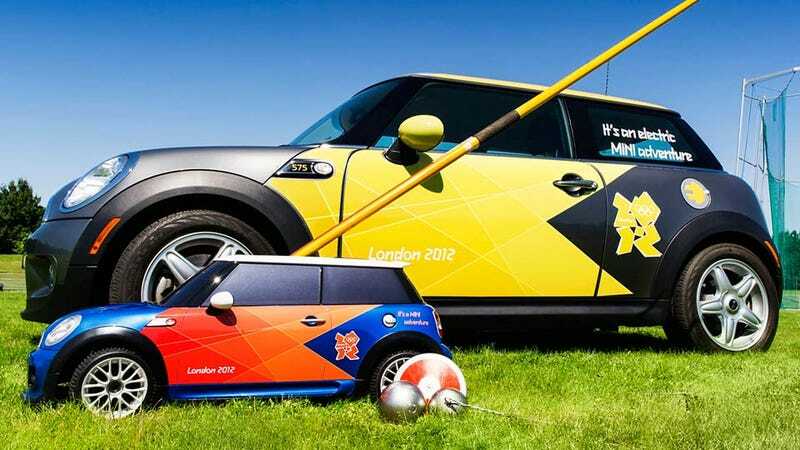 And while it would be awesome if the little cars could fetch the equipment on their own, presumably the judges and other Olympic personnel will be required to load each Mini up after every throw. The cars will be used for both the Olympics and the upcoming Paralympic games, and in addition to helping out with track & field, they'll probably also be used to drive those tiny female gymnasts to the airport once the closing ceremonies are complete.